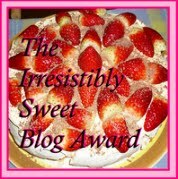 My e-friend Melissa of Mame Musings gave me an Irresistibly Sweet Blog award. I'm tickled pink especially because the people that know me in real life describe me with a lot of adjectives. Sweet is not one of them. So I'm kinda glad that the e-ME is sweeter than the real me. Sight: I watch my babies sleep. I watch them. Sometimes I'm a little late to work because I forgot to stop looking at them and actually go get ready for work. Taste: Hardly anything goes into my babies' mouth without a mommy taste test - for someone that hates mushy food like I do, that's a big deal. Emotional imbalance: I now have intense emotional reactions to parenting events involving friends, family and strangers. Case in point, this morning my cousin's baby was being dedicated in church. I cried as I watched the ceremony online. This was crying complete with the red eyes and snot. Why? Just because motherhood is so beautiful and taking a precious gift to be dedicated back to the Giver of all gifts - SWEET! Now here's the part where I pass the award on to 10 other bloggers. If you read my blog and have a blog, I'd love to read a post on 7 random things about you. So consider yourself awarded and let me know in the comments sections please. I'll round up my childcare week with what I consider to be the best tip every twin parent needs to know when it comes to finding good center-based chilcare. I'll start by sharing the behind-the-scene stories of my childcare searches. After doing all the research, what comes next? Daycare 2 (Calgary): When I knew I was relocating to Calgary, I called a lot of daycares and was told about 12 month long waitlists. The relocators and personnel department could not help. Then I told my manager about my childcare concerns and he told me to talk to a colleague that just had a baby. On talking to her, I found out that my company had a retainership agreement with the daycare that guaranteed my spot. Personnel didn't know this, but a new mother did. Armed with this information, I was able to get two spots and enroll the girls. Daycare 3 (St John's): In St John's I went through the whole waitlist debacle again and had to work from home for a couple of weeks. Whenever I did go to the office, I discussed my childcare woes with anyone who would listen and asked for leads. One day, a senior manager sees me and says he's spent the day looking for a daycare for his daughter and one of the centers he visited had an infant spot and he thought of me. He gave me directions to the center, I visited and the twins started there the next day. Do you see the common thread in all these stories? The best resource that any twin parent can have in getting good childcare is other parents. Talk to them, pick their brains, use their connections. It worked for me especially in St John's. I'm not usually chatty but in this situation; putting all my business out in public meant that everyone knew my childcare problem and were on the lookout for me. For the last couple of months, I lived in St John's, Newfoundland and had to find yet another daycare for my twins. Finding childcare in St John's is hard and I will be remiss not to share a bit of what I learned from the experience. Childcare in Canada has some common threads so I won't rehash those. I suggest reading my post on Calgary childcare. For this post, I'm going to talk more about the specifics of childcare and St John's. Subsidies - The guideline for childcare subsidies is a 35 page document. I did not read it. The better idea is to call the person in charge of the subsidy program. Phone numbers are listed on the government website. Dayhomes - I had a terrible experience with dayhome providers that I looked for online. Unanswered emails, broken appointments and poor communications marred the process for me. I will advise anyone looking for a dayhome to go through an agency. Family and Childcare Connections is the agency of choice for St John's. If you stayed long enough to read this post to the end, you must be really looking for childcare in St John's. All I can say to you is good luck. You'll need it. Doing a project 52 on the twins. I forgot to mention that but I’m putting together a photo each week to capture the 52 weeks of the girls second year. I’m glad I’m doing this because they are changing so much so fast. I started with pictures from their first birthday and will add a picture a week till their second birthday and print a photobook. Busy, busy, busy. Enjoy your weekend all. According to Wikipedia, "a culture gap is any systematic difference between two cultures which hinders mutual understanding or relations. Such differences include the values, behavior, education, and customs of the respective cultures. Culture gaps can relate to religion, ethnicity, age, or social class. Examples of cultural differences that may lead to gaps include social norms and gender roles." Ladies and gentlemen, distinguished members of the reading audience; I have a parenting culture gap. That's not new to me. I am afterall a Nigerian parenting Nigerian-American twins in Canada. I've always known that it would be a tight-rope walk for me as the twins grew older, but I did not expect my first culture gap event so early. What event you ask? Valentines day of course. Each of the girls got a little valentine's card from just about every other kid in the center. In 2 million years, it would not have crossed my mind to buy valentines cards for the twins to give to their classmates. Not at this age anyway. Talk about parenting culture shock! I'm just glad the girls are too young to know that they went to school without any valentines cards. In all honesty, this is an inconsequential matter for now. However I need to work on my knowledge of some of the norms around here so my babies are not socially disadvantaged among their peers due to cultural differences. I suspect this will be the first of many posts on on parenting in North America for expats. While I'm on that note, Megan and Brad commented on yesterday's post expressing their surprise that we could survive on just 4 books. Peeps, I need to tell you - mommy is not the one doing the reading. I'm an avid reader and one of my dreams is to raise kids who love reading as much as I do. However, I am quite content to achieve this by surrounding them with books but not necessarily reading to them. At least not at this stage. I know a lot of parents are able to read to their babies, but so far reading time hasn't worked in our casa. How do you get twin toddlers to sit still? I never make it past one page before the girls start trying to flip the pages by themselves or grab the book away from me or get bored and walk away. We'll call that Tuesday Confession! I don't need as much clothes as I think I do. Toddlers don't need that many toys. We have just enough toys to prevent boredom and even those are not really needed. The girls level of enjoyment with their toys is same as the fun they have with an empty water bottle, a can of puffs, a few pillows and all the receipts in mommy's handbag. Same goes for gear and equipment. We have 4 books, 2 booster chairs, 6 sippy cups, 2 bowls and 2 divided plates. I am mucho super blessed to have adaptable babies who have been quite tolerant of gallivanting the world with mommy and daddy. I’ve seen more than a few members of my parenting forum grumble about gifts given to their kids that were inappropriate/unwanted/ not thoughtful or just plain wrong. And yes, I confess that for the longest time I was the adoring aunty who gifted “educational toys” and life-size kiddie shopping carts much to the chagrin of my sister who has vowed to re-gift the shopping cart to the twins. Yes, I know what you’re thinking another blog post promoting Amazon… but they’re so AWESOME!! I created a “Twins Wishlist” a while back and it was set to public. I used it to curate the books and toys that I planned on buying in the future. Anyone who knew my email address could find my wishlist, order something off of it and it's automatically shipped to me. For security, the sender doesn't get to see my mailing address. One sweet aunty finds my profile on Amazon and we got two of the items on our wishlist in the mail last weekend. Sweet! (thanks B, muah!). It was the Brown Bear and Hungry Caterpillar books by the way. I think every family member can have an Amazon Wishlist . It makes it so much easier for friends and family who are not close by and may not have everyday contact to still get just the right gift. Even if the gift is not purchased online, just knowing what's on the list serves as a good hint. Got this idea from my best friend. She has the 8 year old who has everything and then some. What’s left to get for him? Now she requests that friends and family members just get him giftcard from a particular retailer. 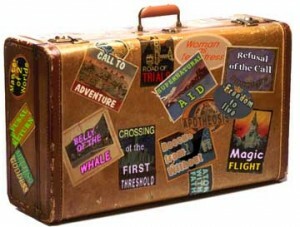 The idea is to collect all the gift cards and buy a major big ticket item when the time comes. To do this, you must be careful to get giftcards that don’t expire and chose a retailer that has a good array of choices for the kid. This would work especially well for older kids who have some expensive items on their wishlist – a motorized scooter, a grand piano, some Apple i-doodah etc. Some people do find gift cards impersonal, but if you let the givers know exactly what the goal is, most will love the thought of knowing that they're contributing to a dream. That's actually how I got my stroller - by combining giftcards from my friends. I was glad to get an item that would otherwise have been too expensive and my friends liked knowing that they got me the stroller of my dreams. Our first doll is the Baby Alive doll from Hasbro. It was a last minute Christmas buy. I had been looking for a doll for quite some time and was beginning to think that my criteria for the first doll would not be met. What criteria you ask? This is the little miss that made the final cut and I was quite happy to find it. Especially love the hair! Reception: For the most part, the girls have ignored their dolls. In the last 2 weeks though, they've played with them a few times. I hope they love the dolls as much as I do.